Prime Minister Benjamin Netanyahu says his vision of a peace deal does not include removing any Israeli communities in Judea and Samaria. 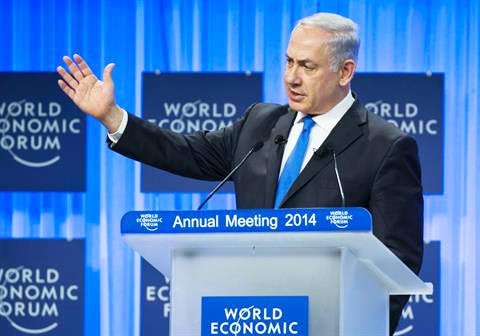 “I have no intention of removing a single community; I have no intention of uprooting a single Israeli,” Prime Minister Benjamin Netanyahu said on Friday at a press conference in Davos, Switzerland, where he was attending the annual meeting of the World Economic Forum. Netanyahu expressing support for Jews in Judea and Samaria will at lest maintain peace inside the Likud party. And National religious Jews will not withdraw their support for the present government. But many Jewish settlers are skeptical to any statement given by the present Prime Minster. They remember to well the bold statements of former Prime Minister, late Ariel Sharon. Sharon suddenly turned hostile, and demanded a destruction of Jewish properties in Gaza. The word “uproot” can be interpretated in many ways. A replacement of Jews and be included in this phrase. Jews might be forced to vacate their settlements, and move into the larger settlement blocks. Many Jewish settler would have liked Netanyahu use the word “remove”. That the government of Israel will not remove settlements existing in Judea and Samaria. So, we have to watch closely, and see what comes next.